With a storm front on the way I decided to cut back my cigar plant drastically and bring some flowers indoors. The plant may survive a bit longer outdoors, but is far too big to be overwintered. 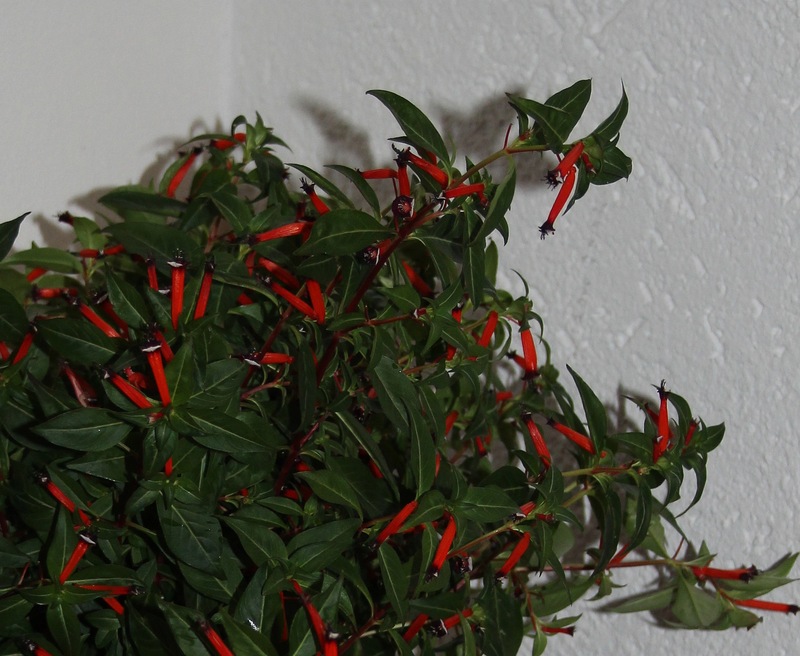 This spring was the first time I bought a cigar plant, or Cuphea ignea, and I rather liked it simply for the incredible growth it put on; as a container plant in the full sun it did extremely well, barely wilting even on the hottest day, and producing red, cigar shaped flowers non-stop from July onwards. I can’t quite decide if I will grow one again though, as it is not really my “thing”! The dark green shiny leaves are also attractive, and are definitely worthy of a mention. Practically all other foliage in the garden has turned yellow or dropped already. What was the most successful container plant you grew this summer, and is it still hanging on? Thanks to Cathy at Rambling in the Garden for hosting this meme “In a Vase on Monday”. It is just beginning to get really challenging to find materials for a weekly vase now, as the number of flowers out there is dwindling! Take a look at Cathy’s lovely autumny post this week as well as the other vases linked in the comments, and see how gardeners from around the world are filling vases as the seasons change. This entry was posted in Garden, In a Vase on Monday, Plants and tagged Autumn, Cut Flowers, Garden, Plants, Seasons, Summer. Bookmark the permalink. I have never see this plant before, that is cool, very pretty! They are a bit unusual, but nice for a change! I’ve seen cigar plant before, and, like you, it’s not really my “thing.” However, that foliage is so lush and dark green, it could win me over as a house plant, and you have made it a gorgeous bouquet. Maybe you could get some cuttings to root and winter it over in the house that way. I grew Pineapple Sage in a container this year, and it grew fast and huge! Just now, as we are near frost, it is putting out tiny cherry red blossoms. Its leaves smell like pineapple when I rub them between my fingers. I like the cigar plant, worth it just for the foliage and I’m looking for plants that will be better on my terrace than mixed pots that don’t look good. It certainly looks great as a cut flower. It stands up to strong sun and heat pretty well Christina, so I’d recommend it simply for its greenery. I’m not so keen on the flowers, but I believe there are other colours less gaudy. It seems very happy in the vase too! Oh my goodness Cathy, this is unusual, before I opened up the image, I thought you were sharing a Fuchsia. I do not really grow anything as exotic as this, I actually still have last winters pansies in some pots that cut back are raring to go again….they have been brilliant value! They like moisture and to be cut back when leggy I have another 4′ in diameter very large pot that I filled with Violas last winter, I pulled those out in late spring, inadvertently leaving the seeds on top of the compost and the violas reseeded themselves, producing an even better summer display. I hate cutting them down when they get to that leggy stage, but know it would probably save them. Occasionally they reseed, but I am a meticulous deadheader – maybe too meticulous! Extraordinary plant! The first picture has a quiet a dynamic and let my eyes roll. But I understand, it´s not your usual style. I think I prefer the more traditional flowers for summer 🙂 , but this plant was such a success. Most of my container plants are filled with succulents, which can last for years without being replanted. I’m less pleased with the containers filled with perennials near the front door but my expectations that I could extended them into fall and winter without refreshing are unrealistic. The coleus, in particular don’t like cooler temperatures (even our version of “cooler”) so I’ll have to find a hardier fall/winter replacement. I like it! I might have to try one of those ‘cigar plant’ types next year. A couple different ones show up regularly around here and I’ve never actually given them a try. It still looks awfully healthy even after all that summer threw its way! That’s the only reason I might give it another go next year – the shiny green leaves are lovely now and were lovely even before it flowered, but I’m not keen on the flower colour. I have never seen other variations here, but I know there are prettier pastel colours too. Actually my marigolds are hanging on with some basil in containers…great vase Cathy and what an idea to use a container plant….most of my foliage is also yellowed and/or gone too so it will be interesting next week when I go looking in the garden to make a vase. My basil plants gave up some weeks ago Donna, so I envy you! But I do have a perennial basil plant in a pot this year and I wonder how hardy it will be. It doesn’t taste as good, with leathery leaves, but the bees love the flowers! Wow! I like the looks of your Cuphea ignea and it certainly makes a dynamic arrangement. But good for you for knowing your mind. I didn’t grow anything in containers this year, but I think I’m coming out of a gardening slump. Maybe by next spring I’ll be inspired. If I could find a different colour Cuphea I might plant it again, but the orange is a bit gaudy I think. I hope you get inspired in the spring Susie. My pots always brighten up my front door and patio area and are a nice and cheerful addition in winter especially. We have all forgotten single subjects whilst there has been lots of different things to choose from, so this is a reminder – and it deserves a vase of its own after doing so well all summer. I thought it was a chilli when I first opened the post! My best ‘pot’ has been the galvanised tank with fuchsias and petunias in, showing me how effective a big container can be – but I am interested to hear Julie talk of cutting her pansies back as I still have a few hanging on too. Thanks for all your regular contributions. To be honest I couldn’t find anything that would go with this in my vase this week, so it had to go in alone! LOL! I love fuchsias but haven’t had much luck with them in recent years. 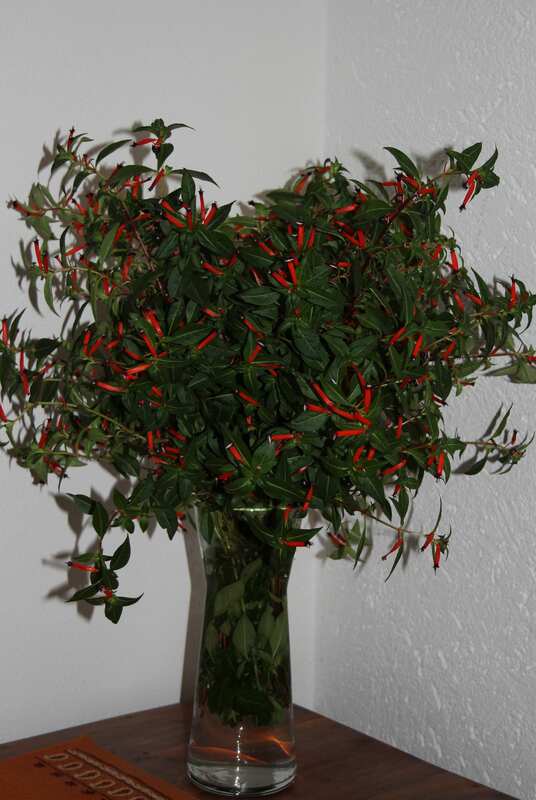 A great exotic in your vase. It may not be your thing but still a stunner. Does it have a cigar smell? I have grown this plant before but it never did very well. I love it in a vase like this. It looks gorgeous. Very impressive. It was a tiny plant in spring and has grown to enormous proportions, so either I was lucky or Cupheas love the conditions I can offer. I didn’t get a photo of it in the pot outside as I wasn’t terribly keen on the flowers! It looks great in a vase, mind you. Wonder how long it’ll last? My star plant in the container was definitely the mix of Pennisetum s. Rubrum and white Bidens which has been flowering for months and has no intention to stop. I planted three cigar plants this year in one of my beds – they did well in heat we had this summer, which I was very pleased with. They seem to tolerate drought nicely. They did not get anywhere near as large as yours did in the container, though – wow! I curtailed most of my container plantings due to our third year of drought. I did pot a few succulents and they’re doing fine. They’re not providing a burst of color like yours, though. That slope is amazing. I’ll keep my eye out to see what you come up with. I’ve tried a few gadgets for my pots over the years to help with the hand watering chore.They dry out so fast in the summer heat. I love the way they look though, and I also enjoy freshening up the patio and deck with seasonal annuals. Sigh.